In the lawsuit over the Atlantic Yards environmental review, both plaintiffs and defendants are doing their best to cite relevant precedent and spin the case to their favor. 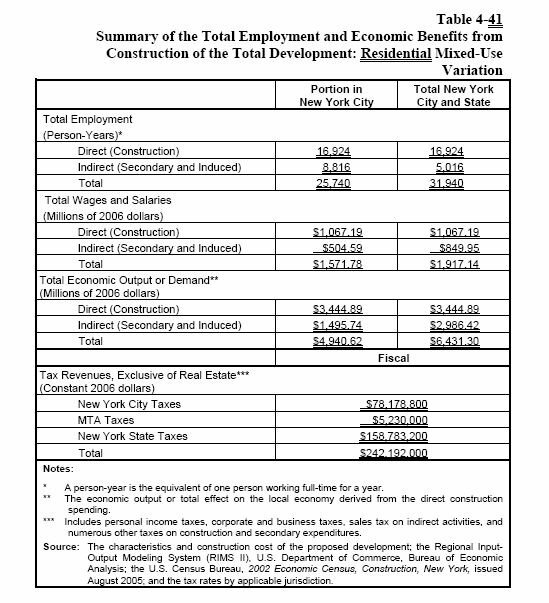 But Forest City Ratner executive Jim Stuckey takes it one step further, in an affidavit claiming (right) that the Final Environmental Impact Statement (FEIS) issued by the Empire State Development Corporation estimated that the project would generate $5.6 billion in new tax revenue and $4.4 billion in net tax revenue. There's nothing of the sort in the FEIS. There's no total at all, nor is there an attempt to calculate net revenue, which subtracts costs. 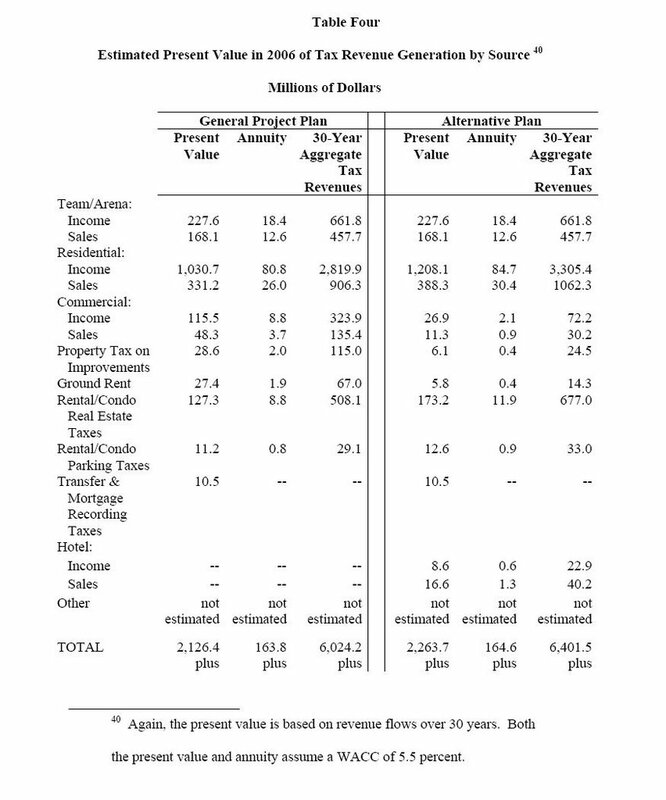 Rather, another document issued by the ESDC, the General Project Plan, does calculate new tax revenue and net revenue. However, that net revenue is just $944 million. My discovery last December of that figure, which represented a reduction of nearly 50% from previous estimates, led to widespread media coverage and expressions of concern by the Citizens Union. Where does the $5.6 billion figure come from? Not from the ESDC, but from Forest City Ratner. And the methodology used to reach that number differs in two significant ways than the methodology used by the ESDC. In Chapter 4 of the FEIS, Socioeconomic Conditions, text and charts estimate new revenues. At the very end of the chapter, less than two pages offer a cursory description of direct subsidies without any attempt to estimate the full public costs of the project. Below are two charts that calculate new revenue from the most likely variation, the residential mixed-use variation. 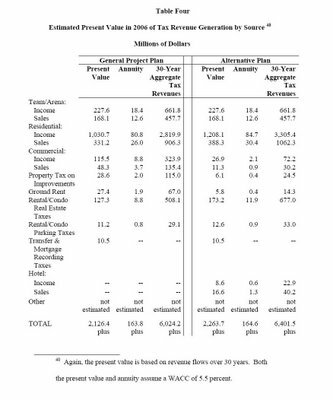 Even if you multiply the annual revenues by 30 years, the number reaches $2.09 billion, plus $242 million in construction-related revenues. At a development cost of $4 billion, Atlantic Yards will be the largest private investment in Brooklyn's history . As renowned sports economist Andrew Zimbalist has noted, Atlantic Yards will be an economic engine for Brooklyn, the City and the State, generating more than $5.6 billion in tax revenues over the next 30 years. There are two important differences in methodology. First, Zimbalist inflates his figure by calculating new income tax revenues based on new residents, rather than on new jobs. 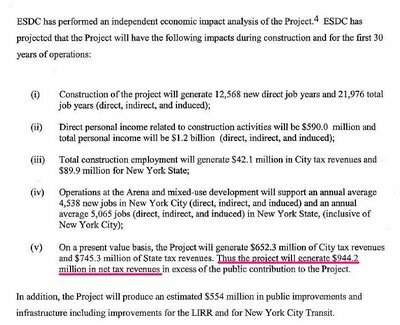 Last year, in The $6 billion lie, I quoted economist James Parrott, who said, "I don't know of any serious cost-benefit analyses of mixed-used economic development projects that count the taxes of residents." 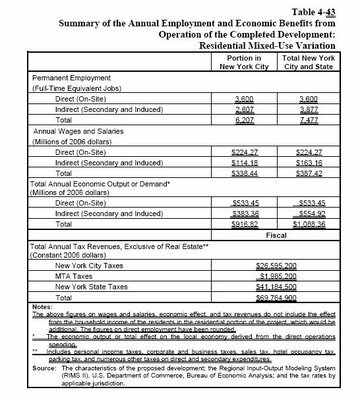 For either variation, projected tax receipts do not include income tax paid by the residents at the proposed project or income tax from secondary employment generated by such residents. Secondly, as I wrote last year, Forest City prefers to use the 30-year aggregate new revenues, rather than net present value, or today's value of future payments, with an interest rate applied. Net present value is, of course, significantly lower. 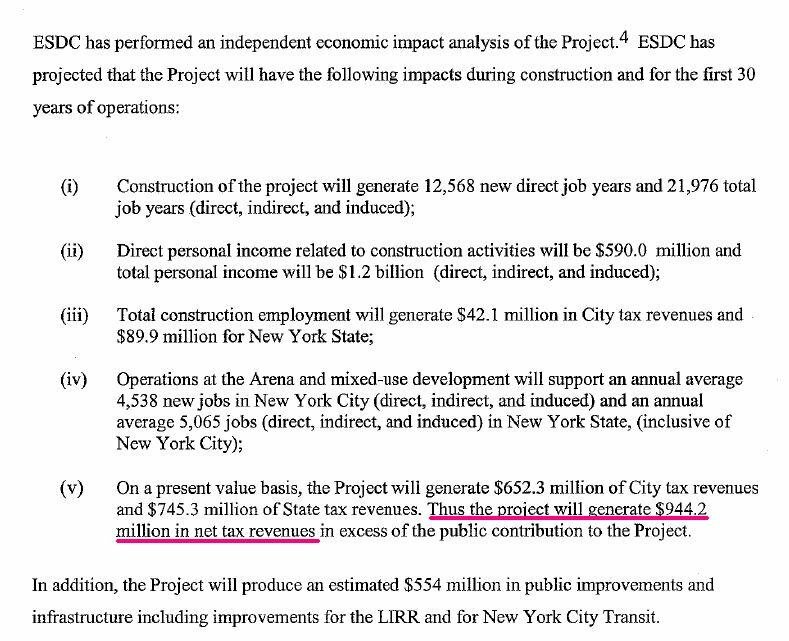 All other fiscal impact analyses of Atlantic Yards, conducted by the ESDC and outside analysts, use net present value. Zimbalist, undoubtedly at the behest of his client, provided both numbers, and Forest City Ratner has chosen the larger one. It's like saying the value of your $300,000 home loan is several multiples greater because you've paid that sum cumulatively over 30 years.